Press Release: Breakthrough thermal study proves ICF walls provide up to 58% more R-Value/RSI than wood frame Walls. Breakthrough thermal study proves ICF walls provide up to 58% more R-Value/RSI than wood frame Walls. Ottawa, ON., May 8th, 2017 – The Insulating Concrete Forms Manufacturers Association (ICFMA) recently commissioned CLEB Laboratories to conduct a comprehensive series of impartial studies comparing a typical insulated wood frame cavity wall to a typical insulating concrete form (ICF) wall. The study confirmed that the tested ICF wall assembly provided 58% more R-value/RSI than the tested wood frame assembly. For decades, the ICF Industry has been asked to provide definitive proof that thermal mass, the air-tightness and continuous insulation features of ICF walls deliver real, quantifiable benefits. Many studies have been conducted in the past by the Portland Cement Association (PCA), the Canada Mortgage and Housing Corporation (CMHC) and the Department of Housing and Urban Development (HUD) all of which were either based on limited field comparisons or thermographic computer modelling. This is the first time a fully SCC & IAC Accredited, and internationally recognized testing facility has been commissioned to evaluate a realistic side-by-side comparison of the two types of wall assemblies within a single study. The calculated results of the test were as follows: the ICF wall assembly provided a standardized thermal resistance of R24.1 and the wood frame wall assembly provided a standardized thermal resistance of 15.2. In this test, the R-value of the ICF wall was 58% greater than the wood frame wall. A PDF of this report can be found online at icf-ma.org/thermalstudy or by contacting Natalie Rodgers, ICFMA Marketing Committee Chair at marketing@icf-ma.org. 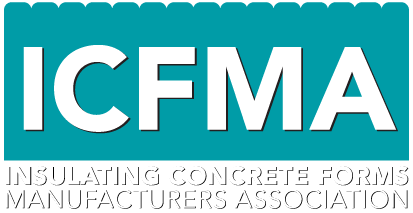 non-profit trade association for the Insulated Concrete Form industry and was founded in 2014 by a dedicated group of manufacturers with the interest of improving the quality and acceptance of Insulated Concrete Form construction.